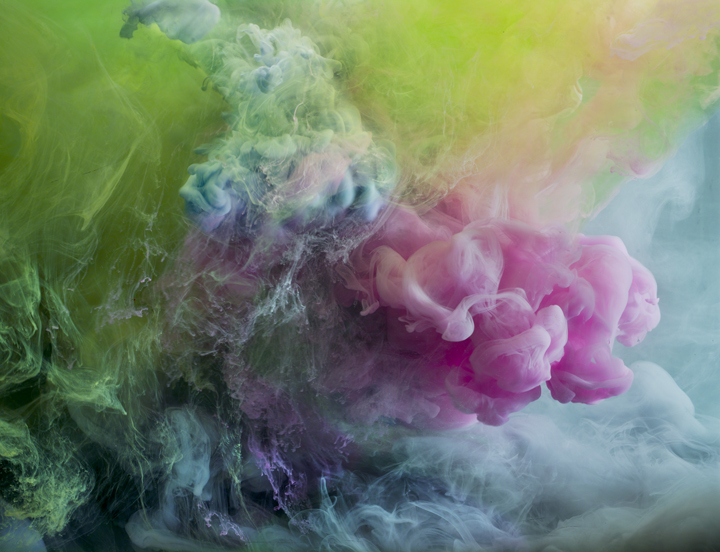 Trained as thermal engineer (having worked on several NASA projects), photographer Kim Keever fuses the images of his childhood fantasy with his knowledge of science and physics. His exploration into his unique process began by trying to physically recreate the imagery of his memories. By constructing intricate landscapes inside a water filled aquarium, he was able to create the mysterious atmosphere of the mind. Inspired by memories of his father mixing condensed milk and water, one memory helped to complete the other. As Keever continued to explore, his photography evolved from atmospheric landscapes, to bold abstract compositions, allowing the materials to create expressions. Bright pigments hang weightless, captured in digital form. Keever states, “the idea has become a machine that makes the art”. Keever’s work is included in numerous collections, including: the Metropolitan Museum of Art, New York; Museum of Modern Art, New York; Brooklyn Museum of Art, Brooklyn; Hirshhorn Museum, Washington, DC.